Reminder: strawberryluna @ The LA Renegade Craft Fair this weekend, come say hi! Well, thank you so much San Francisco! We had a lovely time in your city again, but it’s time to move on down the Pacific Coast Highway to Los Angeles for some more California Dreamin’ at the Renegade Craft Fair LA on July 16th & 17th this weekend. 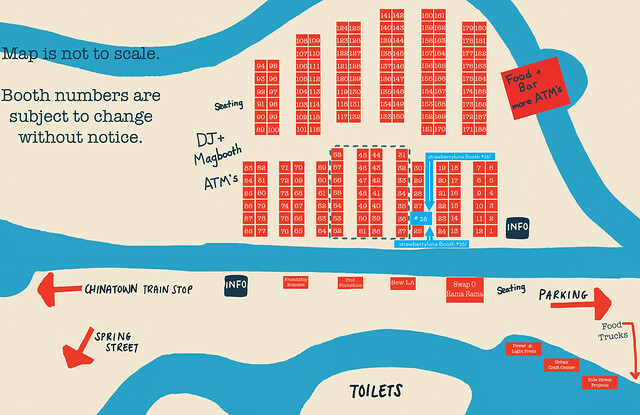 LA Renegade Vendor & booth map, with strawberryluna at #26. Click to see a larger version. As always the Los Angeles Renegade Craft Fair will have tons of amazing vendors and lots of super cool and crafty free demos and special events. Renegade Craft Fair is always FREE to attend and super family & pet friendly. No, really. So come on out to one, or both 🙂 We’d love to see you there! Details below, cause we’re friendly & helpful like that. When: July 16th & 17th from 11am – 7pm both days. Where: Los Angeles Historic State Park, aka The Cornfields. Click here for info & directions. What: Over 200 amazing vendors (<– Click to see the full list of artists & crafters for Los Angeles) of handmade goods, interactive craft workshops by Power & Light Press, Professor Pincushion, Sew LA, Swap-o-rama-rama, The Urban Craft Center, Side Street Projects, & more! DJing and music by the awesome KXLU and Amoeba Music! And the Second Acts Animal Rescue will be on hand raising awareness and funds for their incredible work with animals. Delicious food and beverages by fantastic local food trucks and restaurants from the LA area. There will also be FREE raffles of some of the work for sale from the Renegade Handmade shop in Chicago too. Yay! Click here for more info! Cost: FREE! Totally, completely and awesomely FREE to attend. West Coast Renegade San Fran & LA Fairs, here we come! 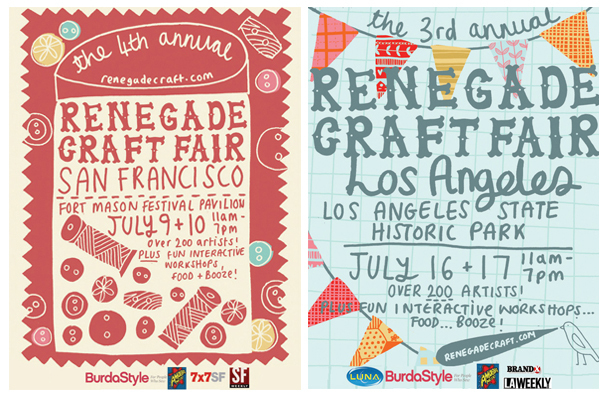 Click for more info about and directions to both San Francisco and Los Angeles Renegade Craft Fairs! California Dreamin’, that’s us this month. We’re taking the big step of doing not just one, but TWO Renegade Craft Fair shows on the beautiful California coastline! That’s right! We’ll be at both the San Francisco Renegade Craft Fair on July 9th & 10th and then we’re heading down the Pacific Coast Highway, taking the scenic and slow route to Los Angeles for the next installment of the Renegade Craft Fair LA on July 16th & 17th the following weekend too. It’s truly a business and pleasure trip and we’re super duper excited. San Francisco Renegade Vendor & booth map, with strawberryluna at #35. Click to see a larger version. Click here for more info about & directions to Renegade Craft Fair in San Francisco! When: July 9th & 10th from 11am – 7pm both days. Where: Fort Mason Festival Pavillion right on the Bay! Click here for info & directions. What: Over 200 amazing vendors (<– Click to see the full list of artists & crafters for San Francisco) of handmade goods, interactive craft workshops by The Museum Of Craft & Design and Accessorize With Small Toys & more! Delicious food and beverages by Tante’s, Ms. D’s Fabulous Catering and Neetos Café. Click here for more info! Click here for more info about & directions to Renegade Craft Fair in Los Angeles!